It does not matter what order the fields are in, they will be aligned on the next page. 5. Voting Group allows you to separate out which students can vote in a particular election. Typically schools will use grade level to separate grade level elections. 6. For passwords if you have access to a student password you can upload that. Many schools will use birthday as a password to get students started. For extra security you can turn on "Require Change Password". 7. If students have changed their password you have the option to leave their passwords as is or wipe all the passwords out and reset them with the new values being uploaded. 8. If you are using Birthdates as your default student password, we recommend you choose "Yes". 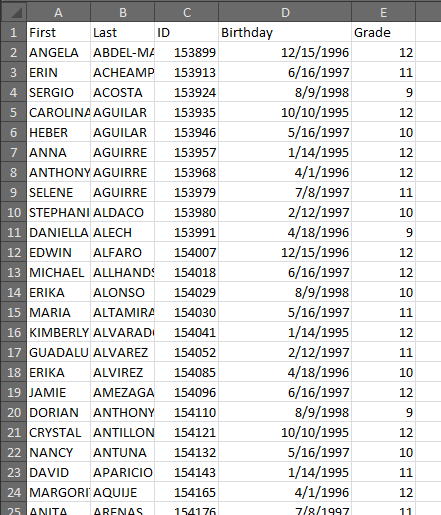 We will format the birthdays to m/d/yyyy (example 2/5/1997) and update the message to your students on the login page. 9. If you are using the option Require Student E-mail and have student E-mails to upload, you can align the column to your student E-mails. 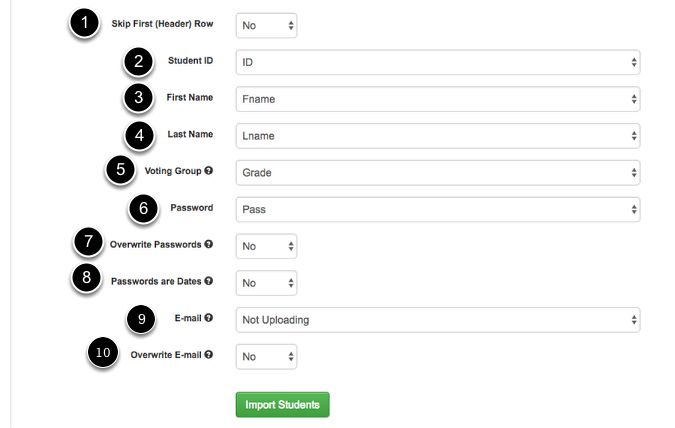 For step 5 (above) you have the option to upload all the students in your list into a specific Voting Group. If you choose this option all current voting groups in the system will be displayed and you will be able to specify which group students will belong to. Oops I made a mistake in my Upload! Choose the number of students to display on the screen. You can choose "All" to see all students. Select the "All" option to see all students.